Note: Audio cannot play through both optical and 3.5mm ports at the same time, and that priority will be given to the 3.5mm port if both are connected. Audio can be played through one of the optical/3.5mm, and the HDMI output at the same time. 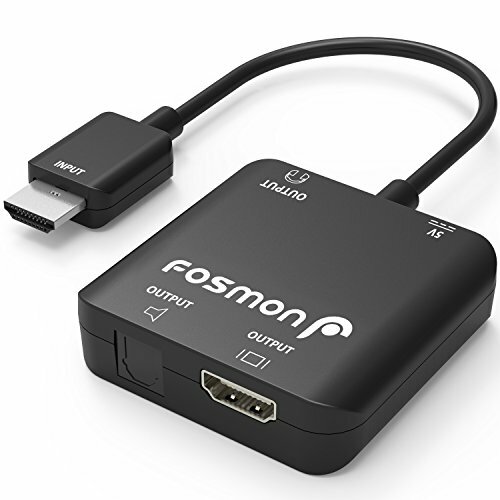 Fosmon HDMI to HDMI + S/PDIF Optical Toslink/3.5MM Stereo Audio Extractor Converter allows you to have full 5.1 surround sound audio that is supported through the optical port, and 2.0 stereo audio will be played through the 3.5mm port. Connecting various sources on this device for optimum performance via HDMI port, Optical/Toslink, or 3.5mm Audio Ports. Connect this port to an audio system with an optical/Toslink cable for up to 5.1 channel surround sound audio. Power supported converter provides a stable signal. [COMPATIBILITY] Play, watch and stream your favorite 3D media with different devices of choice. [MICRO-USB POWER SUPPORT] External power supports charges compatible devices while using. [4K UHD HDR] Enjoy up to 4K@30Hz of resolution with this portable device. [SAMPLE RATES] 16/20/24 bit; 32/44.1/48/88.2/96kHz. [AUDIO FORMATS] 2.0 and 5.1 formats; LPCM, Dolby Digital, DTS Audio.